When Ross Cordio and Elias Kolsun started Bloombrick Urban Agriculture in Cambridge, Massachusetts six months ago they shared a common vision. “We both really wanted to do something that was going to help the community and, at the same time, something that was new and cutting edge,” says Cordio. Cordio and Kolsun became enamored with urban agriculture models like rooftop gardening and vertical farming, but wanted to approach their journey into urban agriculture gradually. “We wanted to start slow and figure out one product that we could really master to break into the industry,” says Cordio. They decided to start by growing microgreens because they are easy to grow, grow quickly, and can be grown indoors. They recognized that indoor growing made the most sense on the east coast because of the short growing season of only four months. 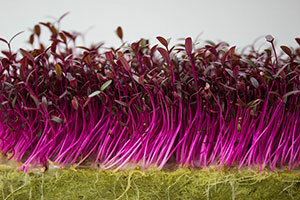 Currently, Bloombrick Urban Agriculture specializes in amaranth, arugula, broccoli, carrot, China rose radish, cress, daikon radish, dark opal basil, dark purple mizuna, garret giant mustard, Genovese basil, kogane cabbage, red cabbage, red gurner purslane, red komatsuna, sorrel, and suehlihung wasabi. They also grow wheatgrass, which they advertise as a “superfood” because of its high concentration of chlorophyll, vitamins, and minerals. Bloombrick Urban Agriculture uses a unique growing system for its microgreens. Rather than growing the plants in soil, they use a hydroponic growing medium called Rockwool. 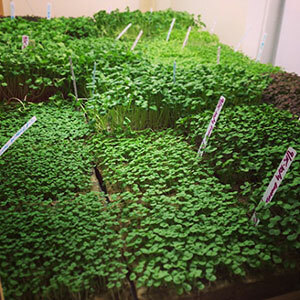 The microgreens are sold in an 8X8 inch square of Rockwool, enabling the plant to be sold as a living food. Once sold, the plant requires some sunshine and water and will continue to grow until the customer is ready to harvest it. Since the Rockwool is biodegradable, this growing method also adds to the product’s environmental sustainability. Cordio and Kolsun have big ambitions for the future, and many exciting projects on the horizon. Since there are no existing urban agriculture zoning laws or ordinances in Cambridge, they have partnered with Cambridge City Councilor Leland Cheung to start an urban agriculture initiative in the city. They have also built a small hydroponic lettuce raft for the Goodwill Headquarters in Boston in an effort to draw attention to their new business and urban agriculture as a whole. With respect to the future of their business, Cordio and Kolsun are planning to expand sooner rather than later. They are currently planning on moving into an incubator space with an open floor plan that they would share with a local brewery, an indoor farmers’ market, and a coffee roaster. When they move into the new space, the pair hopes to start experimenting with other growing systems and products. Their ultimate goal is to expand into a full-scale vertical farming business.